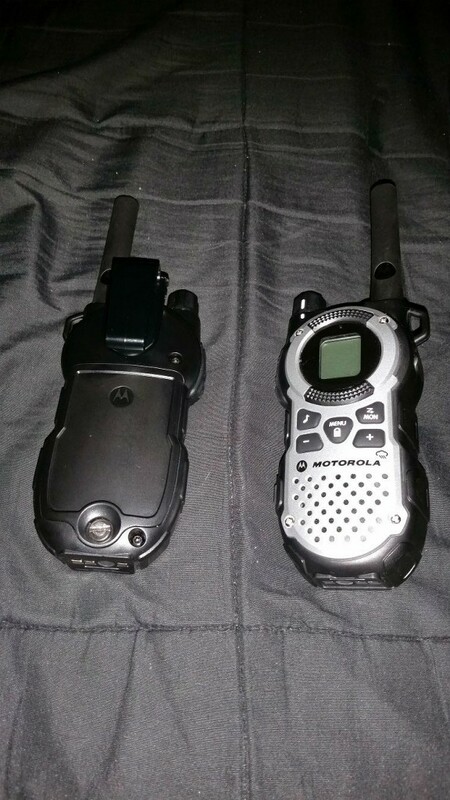 The Motorola MT352R is a high quality and high end two way radio system which is a great choice for anyone who is looking for a rugged and strong method of communication and doesn’t mind doing a little bit of extra legwork for it. The unit is very sturdy, heavy, and made to last. With that being said, nothing is sacrificed in terms of usability. 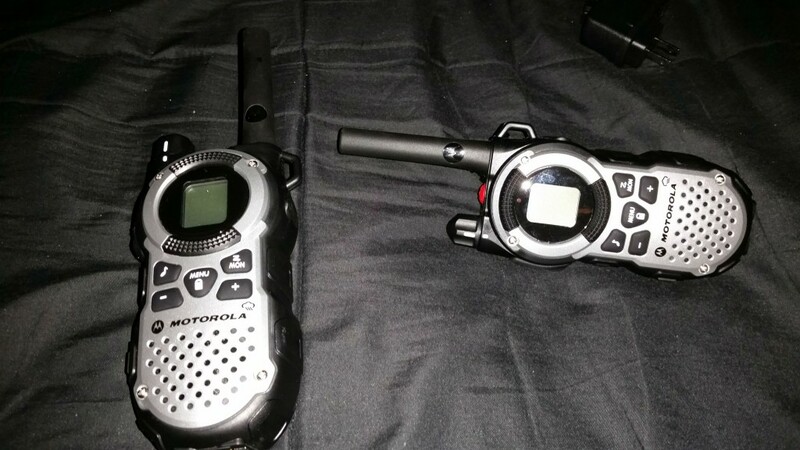 Transmission is good on these radios, and you can expect between 2 and 8 miles of clear communication under good conditions (with 2 being in an urban environment and 8 being in a wide open area). This would be a perfect unit for hunters or workers who need a form of long-ish distance communication when they are working. It is not, however, a good choice for families who need their children to have a radio or for people who are not able to easily carry extra weight over long distances. It is simply a little bit too heavy for those types of situations. The basic makeup of the unit is a sturdy, thick plastic shell. The front of the unit has a removable plastic faceplate that has been attached to the unit by 4 screws. The bottom has connectors for a charging cradle (which is not included and no information is provided about), as well as two hard plastic feet that can be used to set the radio up. The bottom also has the LED flashlight bulb. The left hand side of the unit has the push to talk buttons (high and low power) as well as the USB charging port and the button for the flashlight. The right hand side of the unit has a small hook which can be used to tie the radio to your bag or belt and a spot to attach a headset. The back of the unit has a belt clip location and the battery case. The top of the unit has an alarm button, the power/volume knob, and the antenna. The unit has been weatherproofed. This means that you can use it in all weather (including dust) and not have to worry about the device ceasing to function properly in the middle of your communication. Note: Weatherproof does not mean it will float on water if you drop it into a pond or another body of water. It cannot stand up to the pressures of a body of water, but it will function properly in rain or snow. The antenna on the unit is thick and sturdy as well. It is made of, presumably, hard plastic with a hard rubber shell wrapped around it. You can bend the antenna a bit without damaging it and it seems like it would hold up to the forces it might undergo if it was dropped. The sides of the unit have small indentations in the plastic which will assist with grip. The unit is fairly pleasing to look at, aesthetically speaking. The face of the unit is composed of hard silver plastic. The rest of the unit is black plastic with white accents in some places and silver hardware. The buttons are black rubber and, at least on the face, they have white writing (not glow in the dark). On the side of the unit is the push to talk button and the button for the flashlight. These are not labeled like the rest of the unit is, instead opting for writing which has been etched into the buttons themselves. The volume knob has a white line to indicate where the volume is. The alarm button on the top is bright red (and hard to miss). The shape of the unit could be described as hourglass, but it is not as defined as some others are. The unit itself is pretty large, even for the hand of an average sized man. The MT352R also has some small ridges on the side which are meant to help with gripping the unit. The display is easy to read, with black letting and a bright red backlight which helps with visibility. In all, the unit looks pretty good. The first thing that bears mentioning, as always, is the packaging. The MT352R comes packaged in a standard bubble pack comprised of thin plastic and cardboard. It’s a little bit surprising given the relatively high cost of the unit in comparison with some others. It certainly has a very study build, but it doesn’t make sense to put it into a cheap bubble pack. Regardless, it is certainly easy to get it out of the package when compared with other packages of a similar type. Once the package has been opened, it is easy to get everything out. The unit and everything that comes with it are kept snug so damage is not likely. Installing the batteries is very simple. The MT352R has a very sturdy (and thick) battery case which is bolted to the unit by a small screw which can be easily removed with the use of a coin (or an actual screwdriver if necessary). The casing for the battery is a welcome change from the typical battery cases, which feel like they could snap off at any moment. Inserting the NiMH battery packs that are included with the unit is very easy once you have the case open. If necessary, you can also use loose batteries, which is extremely useful should you run out of batteries when you are out in the field. Battery life is very good as well. You should get a day or so of use out of it, unless you are using it heavily. Turning it off when not in use and using the radio on low power mode for transmission is important as well. Should your rechargeable batteries run out of juice, you can always use loose batteries to extend the life of the unit when you are out in the field. A couple of things bear mentioning here, with regard to the batteries and the charging of the unit. The units come with a single AC adapter that has a split end so that you can use the same adapter to charge both units. This is both good and bad. It is good because it saves room and allows you to use only a single wall outlet. It is bad because the wire that the AC adapter uses to charge the radios is extremely flimsy. A person could very easily tear it accidentally just pulling the radio too hard. For such a sturdy unit, that doesn’t make a lot of sense. When you first turn on the radio, you will be greeted by a very easy to read display with a bright red backlight. Transmitting with the unit is pretty easy. There is a push to talk button right on the left hand side where your thumb will sit. There are two modes of transmission: a low power and a high power mode. Obviously the difference is that the high power will use more of the battery in order to give a boost to the transmission. This will usually result in a louder communication and will help the transmission travel farther as well. The transmission distance that you can expect to get here is nowhere near the 35 miles that the packaging and marketing materials advertise. That, however, is something which is universal in the two way radio industry, so it is not a reason to give the MT352R a black mark. If you are using these units in an urban or a suburban environment, you can expect to get around 2 miles of clear communication. If you are using them in a wooded area, 6 miles is about the distance you can expect. If you are in a clear environment without many obstacles, then you can get around 8 miles of distance. Of course, like with any two way radio system, you will be dependent on the weather in your local area for maximum transmission distance. The volume is pretty great on these radios as well. It is loud and clear, even at some of the lower volumes. That is a breath of fresh air for an industry that usually thinks that “moderate volume” means you have to turn the volume knob to 11. There are two functions which have been added that give this unit a little bit of extra oomph. There is an LED flashlight included on the bottom of the unit. It is not too bright, but it is definitely bright enough to be used to great effect in a dark room or other dark environment. Additionally, there is an alarm feature on the radio which can be used to alert other people to your presence if you become injured or lost in the field. It appears as though this model does not come with NOAA weather stations built in. This is pretty disappointing because nearly every two way radio model comes with that functionality without any additional cost. This is not something which makes or breaks the radio on its own, but it not being included is somewhat strange. Neither the instructions nor the product details include any information about NOAA stations, so one has to assume that they are not on the radio. It bears mentioning that the faceplate on this unit has screws on the four corners, indicating that you should be able to replace it with another faceplate should you so desire. That is, unfortunately, not the case. According to the insert that comes with this unit, you cannot replace the faceplate on it. The fact that there are very visible screws on the faceplate is a confusing inclusion for that reason. There is a possibility that removing them would allow access to the inside of the unit, but that would be counterintuitive because doing so would void the warranty. This unit does not include the standard accessories that many cheaper radio sets come with. This includes things like headsets and a charging cradle. 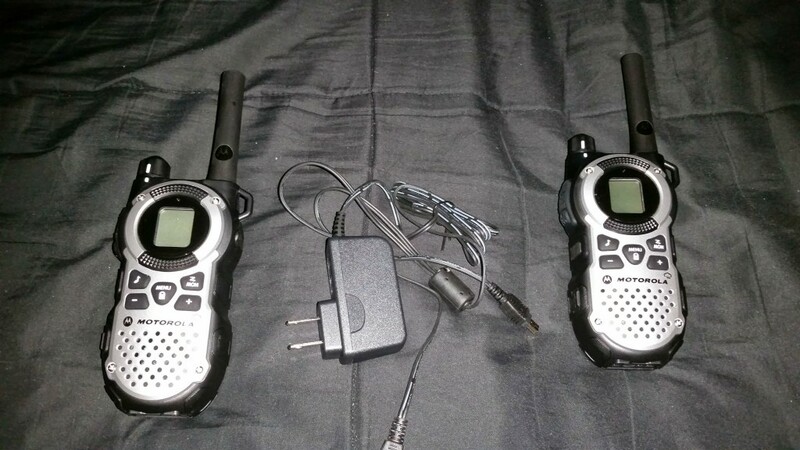 Given the price of the unit, a person would expect these things to come with it, especially considering, again, they commonly come with less expensive two way radios. The charging cradle is especially baffling. Why? Simple. The bottom of the radios have connectors to charge inside a charging cradle. Why one was not included is a mystery. The MT352R is a great radio for the price. With the very sturdy build and the long transmission range, it is perfect for a wide variety of situations. There are not a lot of times when this radio would not be a benefit to you in the field or when working. With that being said, the unit is somewhat heavy and bulky. That, if anything, is one of the only downsides. The unit also does not include a headset or a charging cradle (though it does have an AC adapter). Even so, the extras included with the unit (sturdy battery case, LED flashlight, alarm system) more than make up for that.